The Costa Concordia wreck has finally gone from the views of the Italian island of Giglio. The ship departed the island at 11 am local time towards Genoa, Italy where it will be scrapped at the shipyard. operations began way before at 6 am where engineers had been making final preparations for Costa Concordia’s departure. The ship isn’t sailing to Genoa itself, its being towed at an average speed of 2 knots. The ship is expected to arrive at Genoa between July 25th and July 27th and this depends on any issues occurred during the tow voyage. Weather will also play a large factor in its arrival time. The journey north towards Genoa will include a fleet of supporting vessels from the UK, Italy, Spain and Panama. 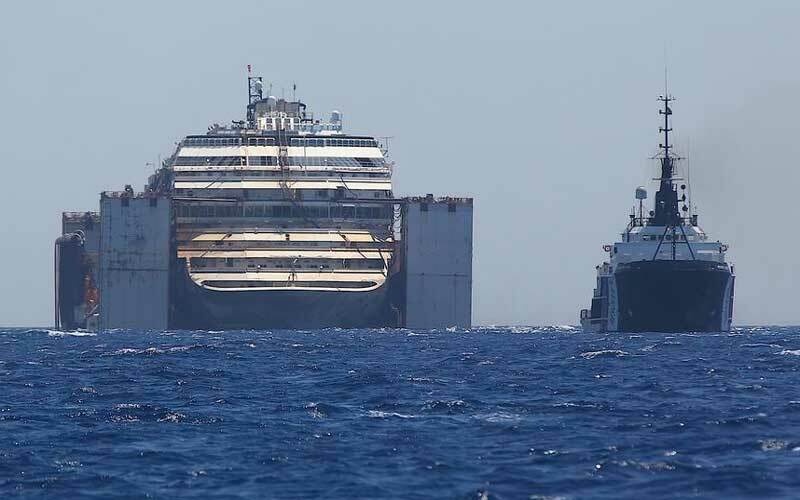 The vessels will sail with Costa Concordia and some of them will be ready for any problems that arise. Many risks towing such a large ship have been reported but engineers have stated that the operation should go to plan without any major problems. People living on the Island of Giglio can spend their first night without seeing the Concordia wreckage near the shore rocks for the first time since January 2012. Attention will begin to fade and island residents can happily continue without all the media attention. Scrapping the Costa Concordia is set to be worth at least 1 Billion Dollars to the Italian economy and will take many months to do. At the moment the ship is making its last voyage ever with some help of course.